10 members of EBJI competed at the 2012 San Jose Buddhist Tournament on January 29, 2012. Held at the San Jose Event Center on the San Jose State University Campus, this regional tournament attracts over 700 competitors from around the state. EBJI brought home 9 medals: 2 Gold, 5 Silver and 3 Bronze from the tournament. Cole Filson and Curtis Booth led the way for EBJI winning all their matches en route to their gold medals. 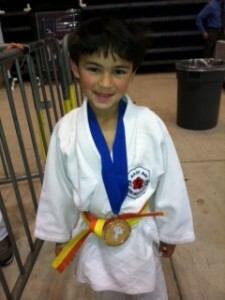 Masa Matsumoto, Mike Myers, Robby Jones, Nico Gonzalez and Ashley Booth all brought home silver medals. Sato Matsumoto and Estefany Gonzalez rounded out the medal count by bringing home the bronze. Marley Filson also represented EBJI well and gained valuable competition experience. Congratulations to all EBJI Competitors!